Portable heaters provide solutions to heating in multiple locations. They are quick and simple to operate and will provide good service if they are used carefully and sensibly. However, any type of portable heater can start a fire if it is misused. Turn off portable heaters before going to bed at night. Choose an appliance that meets the British or European safety standard. Follow the manufacturer’s operating and maintenance instructions. Keep them clean and serviced regularly. Extra checks are required if the heater has been stored and not used for a period of time. Ventilate rooms where the heater is to be used. Ensure a permanent safety guard is fitted. If the heater is to be used in one place, fix it securely to a floor or a wall. Air or dry clothing on heaters. Leave children or pets unattended if portable heaters are switched on. Move the heater while it is alight or switched on. Stand or sit too close, your clothing may melt or ignite. Place heaters where they can be knocked over or where a door could open on to it. Use flammable adhesives, cleaning fluids or aerosol sprays near a heater. Remember that fumes given off from some products are heavier than air and will travel some distance. Keep flexes as short as possible. Position the flex so that it will not cause a trip hazard, ensure it will not pass under doors or carpets. Never operate with worn or damaged flex. Ensure that the flex is not exposed to the heat from the appliance or from high temperatures from other sources. Check and fit the correct rated fuse in the plug. Plug the heater directly into the mains socket and avoid using multi-way adaptors. Do not control a radiant heater with a timer switch or a thermostat unless fitted as an integral part of the heater. There are now many forms of powerful domestic heaters available, which are fuelled by liquid petroleum Gas (LPG). Ensure a Gas Safe (formally CORGI) qualified person services the appliance regularly. Extinguish other heaters and all other ignition sources, e.g. Cigarettes, pilot lights on cookers and keep smokers away. Never change a cylinder on a stairway or on an escape route. Check that the valve on the empty cylinder is fully closed before disconnecting the heater. Do not turn on valve of the new cylinder until the heater is securely reconnected. 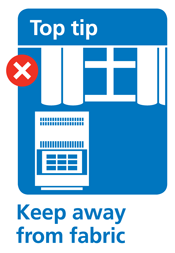 Do not operate the heater and remove it to a safe place outside the building. Brush soapy water onto the flexible hoses and valve assembly. This will show any leak by ‘bubbling’. The equipment should not be used until all leaks have been rectified by replacing faulty parts in accordance with the manufacturer’s instructions. Take extra care with small camping heaters designed for use with a pierceable cartridge. Ensure it is empty and the heater valve is in the off position before removing the cartridge. Store spare cylinders separate to the heater in use. Keep them outside and in an upright position. Never store them in basements or cupboards under the stairs, or near to electrical switchgear or meters.